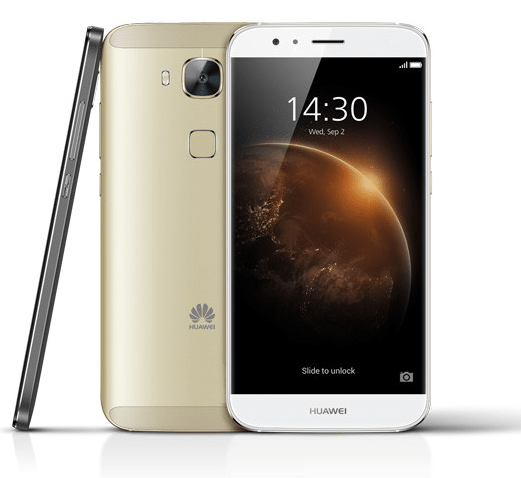 Huawei has debuted in Thailand its newest member of the moderate G-line of midrange Android smartphones, the Huawei G7 Plus. The smartphone comes with a rounded all-metal design, 5.5-inch screen panel and can be seen as the improved version of the successor Ascend G7. It kicks off its presence in Thailand where it will sell for nearly $300 to slowly become available worldwide. The Huawei G7 Plus has 90% of its body covered in metal. Its 5.5-inch IPS display features a resolution of 1920 x 1080 pixels, topped by 2.5G Corning Gorilla Glass surface. Sports a 13 MP rear-facing camera with dual-tone LED flash, auto-focus, and sapphire lenses to adjust the transparency of the image. On the front side is found the 5 MP selfie snapper unit. The G7 Plus runs on the octa-core Snapdragon 615 processor clocked at 1.5GHz, backed by 3GB of RAM and 32GB of internal storage supporting expansion via microSD by up to 128GB. The handset currently ships in Thailand running Android 5.1 Lollipop version of the OS along company’s own EMUI 3.1, during February of the next year, it is scheduled to receive the Android 6.0 Marshmallow upgrade. Connectivity supports include the dual SIM support, 4G LTE network, 3G, Wi-Fi 802.11b/g/n, Bluetooth 4.0, high-speed USB 2.0, GPS and fingerprint sensor to highlight its security features. It measures dimensions of 152.5 x 76.5 x 7.5 mm, weighs approximately 160 grams, gets powered by a 3,000 mAh battery, and is available (currently in Thailand only) in Silver, Grey, and Gold colors.